Would you like a unique and creative way to entertain your guests? Imagine what it would be like to have your friends talking about your party for weeks after the event? There are two ways you can enjoy some Tarot Entertainment. 1. Your Special Event: You can hire Geraldine, or one of her colleagues, for your event or party. She will provide an uplifting, entertaining and positive dimension for your guests entertainment. This service is available for birthdays, bridal and wedding showers, corporate events, Halloween parties, weddings, New Year's Eve parties and any other celebratory event -- whenever you want to add something really special to the festivities. You can have a Tarot Party as part of a birthday celebration, a bridal shower or anytime you would like to give a unique and inspiring gift to your friends. The cost for a professional Tarot reader at your event ranges from $150 to $200 per hour depending on location, how many persons at the event and what you would like to have. 2. A Tarot Meet-up: You can arrange for your friends to get introduced to the Tarot in a safe and fun way. This is not a necessarily a party venue, but just a chance for you to share this exciting tool with a group of your friends. The cost varies depending on the location, the number of persons and the format you would like. Typically, as the hostess, you would invite 5 to 20 friends and I would give a little overview of Tarot, and then you and your guests would do some hands-on work with Tarot. Depending on what you and your guests want, we could also do some "mini" readings. This is a great way to introduce people to the powerful insights of this symbolic tool and to let people see what you are interested in. NOTE: For informal meet-ups like the one described above (#2), you can charge each participant $30 to $60 per person. Email me if you want to discuss dates and other details: geraldinestarot@gmail.com or phone me at 202-441-0415. "I wanted to do something special for my 60th birthday party. I had invited 30 women friends to a summer buffet dinner party where I knew the company would be wonderful and the food great. But I wanted to do something extra special that would be fun and different. 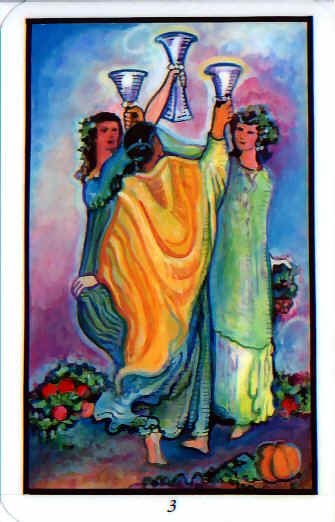 I remembered Geraldine Amaral and the fascinating Tarot class I attended. Though some of my friends were probably not familiar with or even open to Tarot, I wanted to give them this amazing exposure and opportunity as my gift to them for their friendship and sharing this important occasion with me. I have to say we had such an enlightened evening with your gracious guidance! Everyone had such a great time and it spurred some interesting conversations among our group. Im glad it worked out so well!. My friends loved you and the readings so much that they are asking if we could buy a private class in awakening intuition and in creating personal/spiritual protection. Your Tarot readings at our gala were such a treat for so many of our guests. I hope you will consider saving the date for next year's event. We all loved having you there.